The JSE strengthened on Tuesday afternoon on optimism over a strong showing by Naspers, which somewhat managed to diverge investors' focus away from the pessimism that Eskom has brought fourth into the country. At 17h40 the All Share was up 1.03%. Dow Jones futures surged on Tuesday following renewed optimism as American lawmakers struck a deal to avoid yet another government shutdown. Sentiment was further boosted by the pronouncement from the US and China about their positive outlook on this round of trade negotiations. At 17h45 the S&P 500 was up 1.30%. Investors cheered signs of a concession in the debate over US government funding and upbeat sentiment around US-Sino trade negotiations, lifting European shares in the process. At 17h45 the FTSE 100 gained 0.06%. The Hang Seng enjoyed a day of gains on Tuesday after a stellar performance by consumer shares amid expectations that Beijing would take further steps to spur consumption in an attempt to increase growth. The Hang Seng ended the day 0.71% firmer. The Nikkei bounced back from a one-month low on Tuesday, as exporters relished high demand in a weakened yen environment. At 17h30 the Nikkei made gains of 2.61%. Load shedding across the country weighed heavily on the rand on Tuesday sending it on a downward spiral. At 17h45 the rand traded R13.71 against the dollar. A Wall Street rally pushed gold prices higher on Tuesday as two of the world’s biggest economies continued negotiations that are fixated on halting their trade spat. At 17h45 Spot gold was trading at $1 311.60 an ounce. Oil prices gained approximately 1% on Tuesday buoyed by trims in Opec-led production together with US sanctions against Venezuela. At 17h50 benchmark Brent crude was trading at $61.51 a barrel. So as South Africa woke up on Tuesday morning 12 February 2019 they were greated by thy announcement by ESKOM that stage 3 load shedding will be implemented due to continued troubles at their power plants and lack of generation capacity. The minister of Public Enterprise, Pravin Gordhan yesterday stated that the two main new generation plants that cost SA and ESKOM billions were badly designed and prone to reliability issues. On the positive side, SPAR (SPP) came out with a trading update that the market liked. The first retailer not to have their share price hammered after bringing out a trading update. Spar actually bucked the trend and the share price increased after the announcement. See full details about the Spar trading update here. 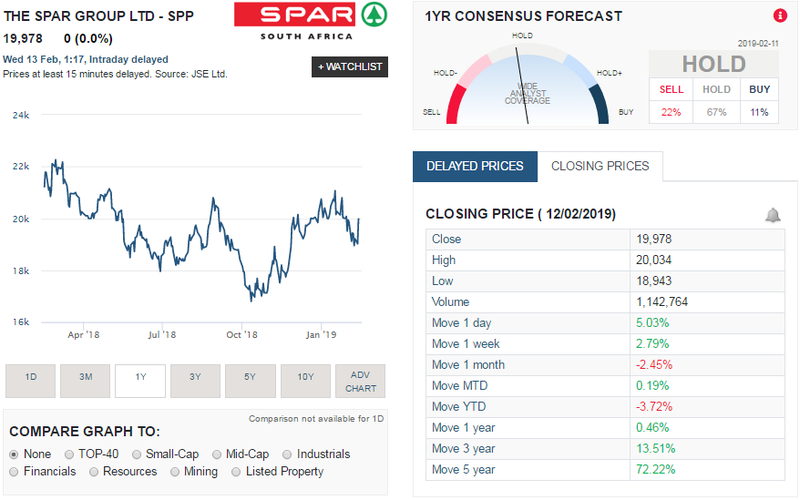 The image below, taken from Sharenet shows the share price performance of SPAR over the last year and provides a summary of share price movements over various periods. As can be seen tot he right of the image, SPAR's share price increased by 5% following their trading update. The first trading day of February ended in the red. In contrast to January in which every Friday ended the day in the green, so far for February 2019 every Friday has ended in the red. So far the market has declined by -0.34% to be exact during the first 12 days of February 2019. Its been a relatively directionless month for the stock market, with movements flip flopping between positive and negative. Neither the bulls nor the bears are currently in control of the markets, so we are basically just moving sideways.